I recently posted my 2011 NL East rankings blog, which puts the Phillies once again atop the NL East. It also showed what we already knew, that there is no comparison between the Phillies and Nationals. The Nationals may have taken Jayson Werth from us, but the Phillies got Cliff Lee. Let’s see how they compare position by position. Just as a quick reminder, this comparison assumes Lidge and Utley will be out all season and these numbers are not based at all on what players have accomplished so far this season, so don’t go screaming at me for giving 20 points to Ibanez, now! LaRoche is a much better hitter than I realized and he made this a competition, but Howard still wins out. It’s hard to believe Valdez can beat out anyone, but Espinoza is even worse offensively than Valdez. Ian Desmond has a lot of potential and may surpass Rollins this year. But until he proves it, Rollins still wins. Placido Polanco had a terrific year, hitting nearly .300. But Zimmerman is a big time slugger, and sluggers always win. At one time, Ivan Rodriguez was unquestionably the best catcher in baseball. Now he’s just an old man and no match for Ruiz. I know Ibanez is in a slump right now, but he will come out of it eventually. And an old Ibanez is still better than Rick Ankiel. After a glimmer in time where he showed some promise, the party is over for Ankiel, as he is simply not a good hitter (or pitcher, for that matter). Mike Morse scored higher than I thought and might be a good comparable to Victorino some day. But Victorino is clearly superior for the time being. The Phillies undoubtedly have the best staff in the NL East and the Nats have the worst. I won’t even waste your time discussing the first four starters since our guys are in a completely different league. Gorzelany is no great shakes, but either is Blanton. I guess we can forget the talk of Blanton being the best #5 in baseball if he isn’t even better than the Nationals’ number five. Believe it or not, the Nationals have a decent bullpen on paper, making this the one bright spot on the team. Balester, Burnett and Clippard have really established themselves as major league pitchers and they anchor the Nationals’ relief core. In a battle of the bullpens, the Phillies get destroyed. Outside of Contreras and Madson, the Phillies don’t have much to offer. Any bullpen with Baez and Herndon can’t be good. That basically confirms what we all expected, but it is still nice to see. How do the Phillies compare to the Atlanta Braves? I’ve been comparing the NL East teams and so far posted the NL East rankings blog and the Nationals comparison blog. Now it is time to compare the Phillies with the team that some idiots decided would win the NL East, the Atlanta Braves. My brain told me that the only real threat to the Phillies was the Braves. But my rankings showed the Braves may not be as good as we thought. In fact, the Braves finished in third place in all three categories and overall finished in a tie for second place with the Marlins. Let’s see what happens when we match them up head to head with the Phillies. Freeman is a pretty good hitter and will help the Braves this year at first. But Howard is a potential MVP every season and Freeman is not. The matchup is Dan Uggla versus Wilson Valdez. Any questions? Rollins has not hit well in over two years, but he still gets the nod over Gonzalez. Chipper Jones may be close to retirement, but the guy can still hit. Based on how quickly he responded to the knee injury, he should still be able to provide some production for the Braves. As good a hitter as Polanco is, he can’t compete with the power Chipper Jones can provide. As much as Phillies fans love Chooch, he is nowhere near the offensive player that McCann is. Ruiz wins defensively, but he doesn’t overcome McCann’s power. Martin Prado has become a decent hitter for the Braves. He slightly edges Ibanez in points and from the looks of things so far, he could destroy Ibanez by the end of the year. I was amazed to see how bad Nate McClouth played last year for Atlanta. He played about as bad as any player possibly can without traveling to the minors. In fact, if it was possible to score zeroes, McClouth would not have a single point. Jason Heyward had himself a pretty good rookie season and he stands to only get better. Francisco is at best a #3 outfielder and Heyward is a possible franchise player. No contest. The Braves have a pretty formidable rotation, but according to my rankings they are only the third best staff. Let’s see why. Tim Hudson is one of the best pitchers in baseball. Too bad Halladay is THE BEST in baseball. Derek had a poor season last year and is better than the 5 points he received, but at this point in their careers, Cliff Lee is better. With Oswalt getting older and Hanson moving into the prime of his career, Hanson will surpass Oswalt soon. But Oswalt doesn’t seem ready to hand the ball to Hanson yet. Jurrjens kills the Phils, but clearly not the rest of the league. Oh yeah, and did I mention I picked Hamels to win the 2011 CY YOUNG award? This one is a toss up, but the numbers give the edge to Beachy. The Braves bullpen is good but not great. They lost Billy Wagner, but Craig Kimbrel looks like a terrific replacement. They are stacked at the top with Kimbrel, Venters, and O’Flaherty, but they are pretty weak beneath them, which is why the Braves bullpen finished second to Florida. Regardless, the Phillies bullpen is bad, making this an easy call. Wow, a tie?! I did not see this coming. Although the Phillies beat the Braves 4-1 in starting pitching, they lost 3-5 in hitting and 0-1 in relief pitching. I think the end of the year will show that starting pitching has a little more weight than hitting, but these rankings say that the Phillies probably aren’t going to walk away with the division. Not a bad start to the 2011 season for the Phillies. Amid "World Series or bust" talk after acquiring Cliff Lee, the 2011 Phillies lived up to their lofty expectations. The Phillies finished April with an MLB best 18-8 record, setting a club record for April wins in the process. As one might expect with a Phillies staff that includes Halladay, Lee, Hamels, and Oswalt, pitching dominated. The Phillies pitching staff finished 3rd in the National League with a 3.18 ERA. Despite losing Chase Utley to injury, the Phillies still managed to score the fifth most runs in the NL (120). If there is such a thing as a good omen, opening day may signal great things to come for the Phils. Down 4-2 in the ninth inning against the Houston Astros on opening day, the Phillies won thanks to RBIs from the most unlikely of heroes: Ben Francisco, Wilson Valdez, and John Mayberry. That win sparked a sweep of the Astros and propelled the Phillies to a 9-3 record to begin the month. The Phillies won each of their first five series and didn't lose one until their sixth series against the Brewers. After losing two in a row to the Brewers, the Phillies finished the month on an 8-2 run. The Phillies lost game one in five of their first six series, but they were undefeated (9-0) in games two and three of their first nine opportunities. 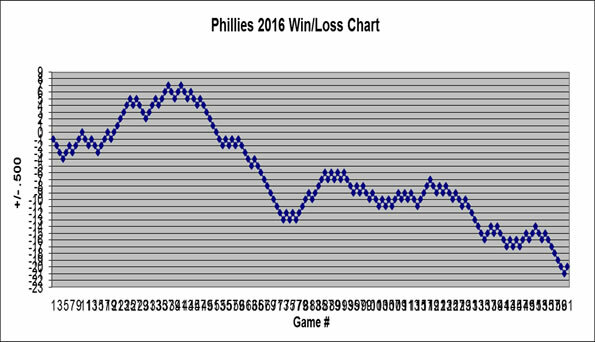 The Phillies were a perfect 10-0 in day games. John Mayberry's walk-off single on opening day. Carlos Ruiz's pinch hit grand slam against the Atlanta Braves. Four game road sweep of San Diego Padres. We have watched Ben Francisco as the Phillies everyday right fielder for 33 games now. In those 33 games Francisco is batting .232. Meanwhile John Mayberry is hitting .308 and still sitting on the Phillies bench. It is time for Ben Francisco to step aside and give John Mayberry his chance. I really like Francisco and give him a ton of credit for performing in Spring Training with his career on the line. He gives 100% and works well as a fourth outfielder. But Ben Francisco is simply not an everyday player. But is John Mayberry the answer for the Phillies? A lot of signs point to yes. Mayberry is a big, strong guy at 6’6” and 230 pounds (as a comparison, Ryan Howard is 6’4” and 240 pounds). He is quiet at the plate, has shown some power in the past, and plays decent defense in right field. 6 walks in 45 plate appearances shows good patience since he generally only gets one chance in a game. And Mayberry demonstrates the maturity one might expect from the son of a major leaguer. But I’m not claiming Mayberry is the next Ryan Howard. There might be a reason why he has been stuck in the minors so long. If he was so promising, why hasn’t Charlie given him the job yet? Mayberry could very well meet the same fate as Francisco if he plays every day. But it is quite clear that Francisco is not the answer and it is time to look elsewhere. The Phillies need to give Mayberry the same chance they gave Francisco. Have him prove that he belongs. Francisco couldn’t do it, but maybe Mayberry can. We all knew that losing Utley and Werth would hurt the Phillies offense, and losing Ruiz just exacerbated the issue. Their injuries have created a gaping hole in the bottom of the Phillies lineup. But there is a silver lining to the ineptitude of the last four hitters: the 2011 Phillies team is perfectly suited for DVR watching! After Ryan Howard bats, you might as well fast-forward to Jimmy Rollins because you certainly won't miss any runs crossing the plate. Is it just in my head? Is it possible that these guys aren’t as bad as they seem? Let’s compare the top of the Phillies lineup to the bottom of the Phillies lineup to see just how far this disease might have spread. It gets even uglier when you narrow it down to the 7th and 8th hitters. OK, so it is as bad as it appears. The guys at the top are doing what they are paid to do, but you can see the stark contrast with the bottom of the lineup. Catchers without Ruiz: .177 average, .250 on-base percentage, 2 HR, 4 RBI, and 5 Runs. That means that the Phillies backup catchers have accounted for a grand total of 9 runs. And four of those (2 RBI and 2 Runs Scored) came via two home run swings! But I am not here to criticize Valdez, Orr, Schneider, and Sardinha. They are what we thought they would be and it is hard to criticize players who are doing the best they can. This simply explains why runs have been so scarce. And our pitching has performed so well that the Phillies have the best record in the NL. That aint bad. But boy do the Phillies need Utley and Chooch back, or what? Does Jim Jackson ever get a day off? Do you ever wonder what Jim Jackson is doing? Probably not, but I'll give you the answer anyway: HE IS WORKING. Jim Jackson better love his job, because between the Flyers and Phillies the guy works nearly every day of the year. Jim must absolutely cherish off-days like yesterday with no Phillies or Flyers. Right?? Well, I was curious on Friday to watch Utley, Ruiz, and Oswalt play for the Single-A Clearwater Threshers. So, I flip over to CSN and whose voice do I hear? Yep, it was Jim Jackson. It was then that it dawned on me: JIM JACKSON DOES WORK EVERY SINGLE DAY. OK, maybe not every day, but it is pretty darn close. Time to play, "How many days off does Jim Jackson get?" Finding Jim Jackson's work schedule is not a difficult task. I simply took the Phillies and Flyers schedules, put them together, and counted the mutual days off over the last full year. It may not be perfect, but it should be awfully close. That means that Jim Jackson works 5 more days in a given year than an entry level, "bottom of the totem pole" worker. But most of your 9-5 office workers get WAY MORE vacation than that, some with upwards of 5-6 weeks of vacation. So, Jim Jackson works 20 more days than many workers. That's nearly 3 weeks more! Who can we blame for Phillies hitting mess? The Phillies offense has been bad enough for long enough, so it's time to assign blame. No blame for the GM or the manager, either. Ruben Amaro assembled an amazing pitching staff and made the Phillies World Champion Favorites. Charlie Manuel is doing the best he can with hand he was dealt. Blame for now needs to go to the players on the field, but who? First, a little process of elimination. Which Phillies players should we NOT BLAME? I'm totally ruling out the players who were not expected to do well. We aren't blaming guys who weren't good to begin with. That rules out Wilson Valdez, Pete Orr, Ben Francisco, John Mayberry, Michael Martinez, Brian Schneider, and Dane Sardinha. Believe it or not, some of these guys might actually be OVERACHIEVING. When half of your team is Minor Leaguers and bench players, it's the regulars that need to step up. Let's compare each starter's stats to where they were at this point last season. Stepping up to me means overachieving, but at the very least it means doing your job. Who Phillies player(s) SHOULD WE BLAME? I hate to say it, but 28 games is enough of a sample size to start looking at Chooch. The fact is, Ruiz's average dropped 127 points. He went from a player we could count on last year to a hole in the lineup this year. He isn't the player I want to blame, but we need his bat at the bottom of the lineup and he's not giving us that. There are a few other players who are on the fence. Jimmy Rollins and Shane Victorino both dropped quite a bit in home runs and RBIs, but their averages went in the opposite direction. I know we are looking for production, but Rollins and Victorino are paid to get on base and that is what they are doing. Howard is a similar case. His average dropped, but his HR and RBIs increased, so he deserves no blame at the moment. Raul Ibanez. Admit it, you thought Ibanez was the one to blame because he stinks now. But Ibanez was nearly as bad last year and he's now a year older, so I think at this point Ibanez may just be finished. My feeling on it is this: it is what it is. The Phillies are an old team who should expect to have injuries. Because they invested so much in Cliff Lee, they can't afford any upgrades in the offense. We all knew this going in, so we can't blame Ruben or Charlie, or (so it appears) the hitters. We just have to hope to get healthy or make a deal at the break. That's it.